Japan is at the forefront of scallop aquaculture; Maine’s emergent scallop aquaculture industry is largely the result of information-sharing and technology transfer with Japanese farmers, scientists and service providers over the last two decades. Maine enjoys a sister-state relationship with Aomori Prefecture, and that relationship has supported communications between the two countries in a wide range of topics, from energy and affordable housing to fisheries and aquaculture. The Japanese Delegation will be coming to Tenants Harbor to visit some of our scallop farms and learn more about our farming activities and our fishing community generally. The delegation includes Dr. Yoshinobu Kosaka, formerly Chief of Planning and Management, Aomori Fisheries Research Agency (retired); Mr. Keita Jin and Mr. Taisei Jin, Jin Fishing Net Corporation, Aomori, Japan; Mr. Yoshio Tamura, Fisherman and scallop farmer, Hiranai Fishermen’s Cooperative. 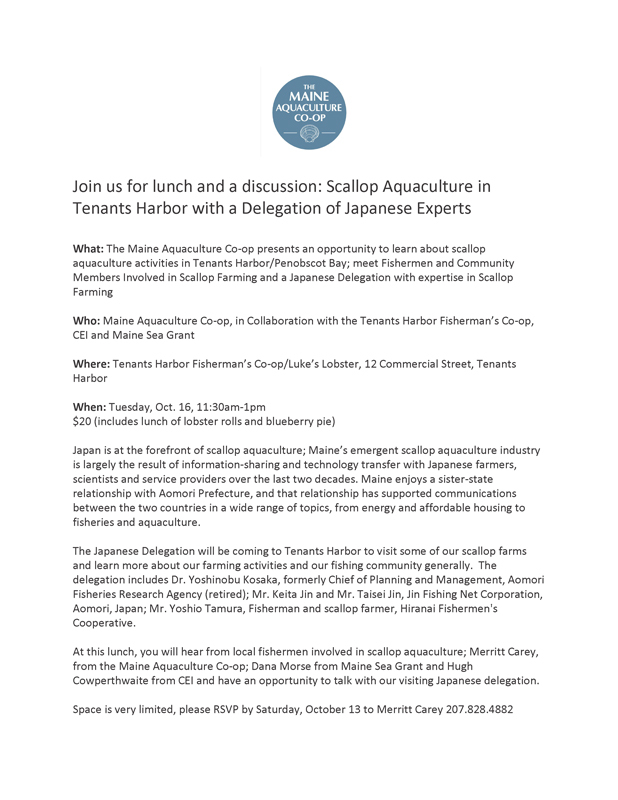 At this lunch, you will hear from local fishermen involved in scallop aquaculture; Merritt Carey, from the Maine Aquaculture Co-op; Dana Morse from Maine Sea Grant and Hugh Cowperthwaite from CEI and have an opportunity to talk with our visiting Japanese delegation.